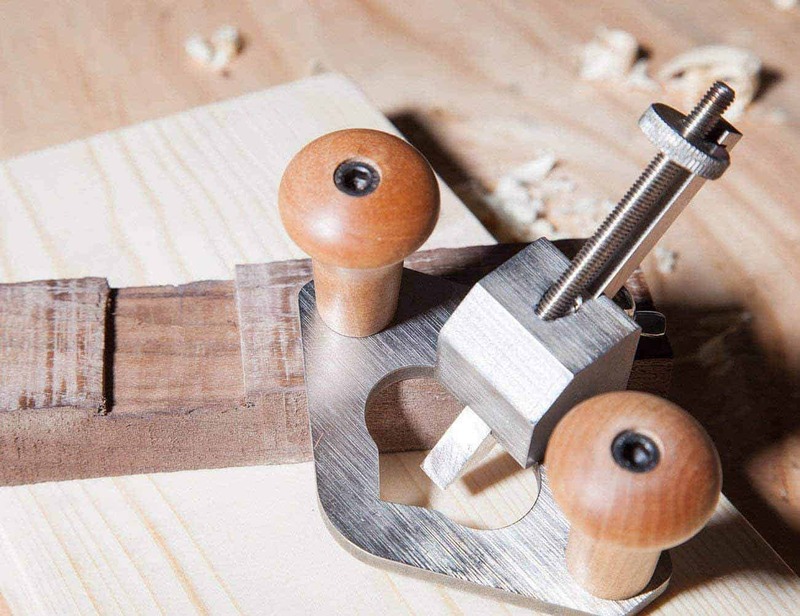 Why use a belt sander? This is the essential sanding tool when you need to do a lot of sanding quickly. Belt sanders are also a solid choice for taking a finish off of something that needs to be refinished. Hand sanding is for craftsman and artisans that don't mind spending the time and a lot of energy but belt sanders are for getting the job done quickly. Who has the time to waste sanding everything by hand, when you can get your project sanded in a matter of minutes using a belt sander? Not only do they give you a better finish, but they also work much faster than other methods. 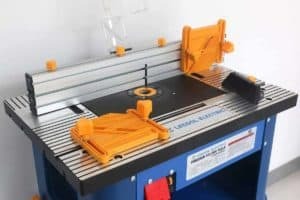 In this article, we will give you the best belt sander of 2018 and all the key features of the products. If you’re interested in learning about the newest models, we have five different models which we can recommend to you. So, keep reading if you’re interested in knowing more. 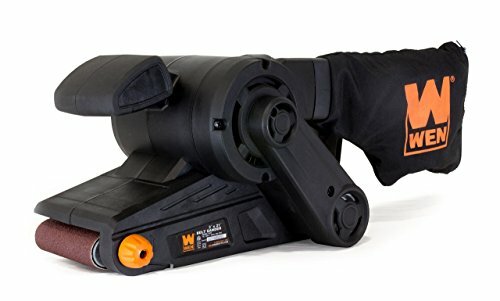 The Tacklife PSFA1A is a belt sander which is designed with a 5-amp motor to help you tackle a variety of tough jobs. It comes with two screw clamps to make it easy to perform when the sand platform is flipped over. It includes a variable speed dial where you can match the speed to your desired needs. You can adjust the removal rates, and the lock-in switch can help you maintain any speed under rough conditions for consistent and long-lasting results. The tool-free belt release will allow you to make changes to the belt quickly. There is a dust collection system which can catch up to 90% of dust, thus keeping your workspace cleaner than ever. The Tacklife belt sander has a powerful 5-amp motor which is designed to be powerful and fast. 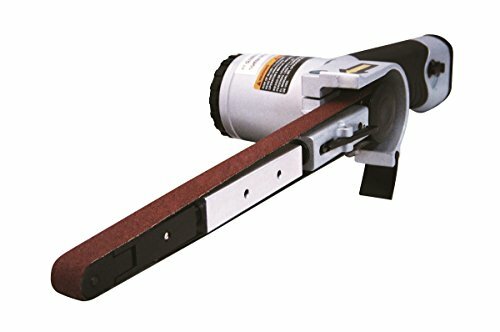 The belt attached to the sander can be changed out quickly for fast and efficient stock removals. It has a new and improved handle for better grip and increased comfort. This can help prevent the unit from slipping when you’re using it. The quick-release belt allows you to adjust the grips and makes swapping the sandpaper much easier. 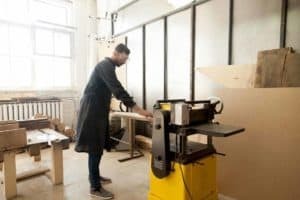 It includes a 10-foot power cord with Velcro tape, so the cord doesn’t get in the way when you’re using the machine to sand your project. This unit is designed to be super safe and easy to use. The belt has been known to be weak and give out, so save yourself some time and purchase replacement belts when you order this product. 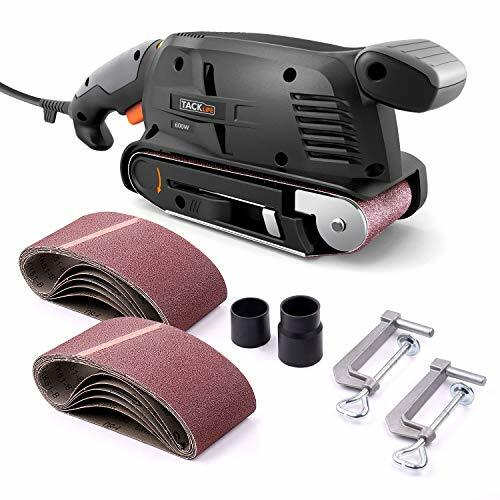 【2 In 1: Bench & Belt Sander】 Equipped with two metal screw clamps, Tacklife belt sander can be turned over and fixed to table, acting as a bench sander, lock-on button helps to free your hand, providing more convenience and flexibility. 【13Pcs Sanding Belts】 Come with 6pcs 120 grit and 7pcs 80 grit aluminum oxide sanding belts, saving your money, meeting the requirements for your different projects. Metal clamping lever for easy and quick sanding belt change. 【Power & Variable-Speed Design】5 Amp motor offers great power to the sanding surface, delivering efficient removal and high quality finish. Variable-speed knob with 6 dials enables you to match the best speed to the application from 0-560rpm. 【High Performance Dust Collection System】The dust collecting box is detachable, can be easily installed and removed, easy to clean dust. 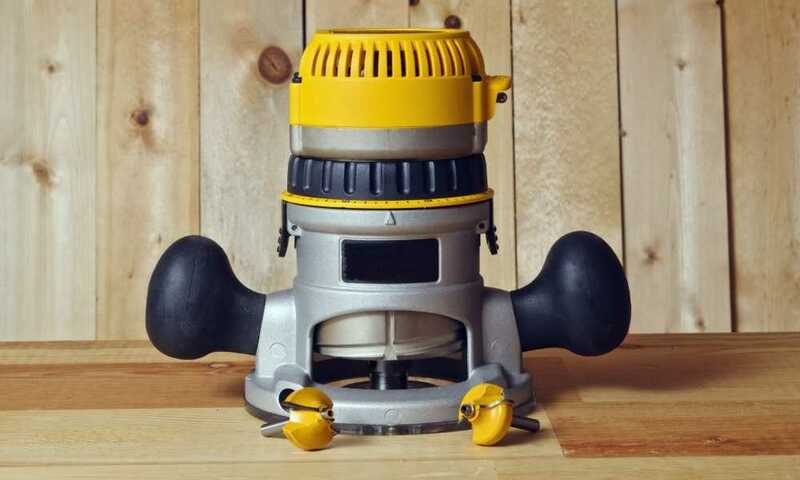 Two vacuum dust adapters, 32mm and 35mm make it possible to connect your vacuum cleaner, reaching the perfect dust collection effect. 【Notes & Full Package】When meeting the problem that the belt slipping, adjust the screw at the bottom to a proper position, then the belt will run in track. Full package: Tacklife PSFS1A belt sander; 13pcs sanding belts; 2 screw clamps; 2 vacuum adapters; user manual; 24 months warranty card. 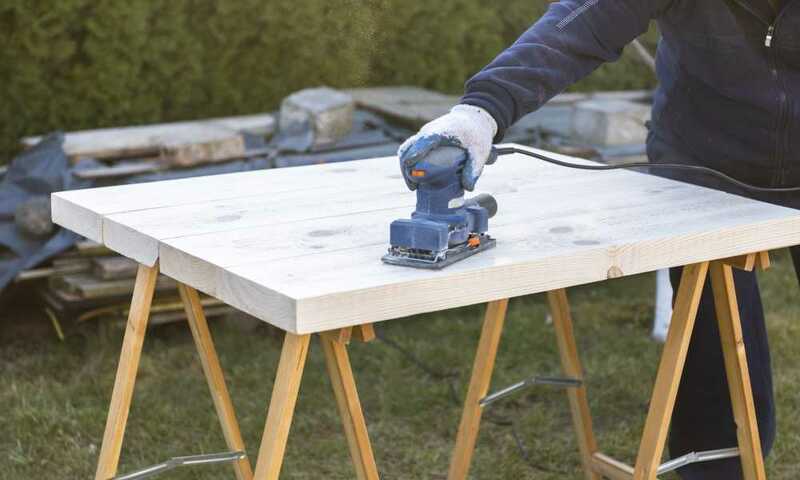 The Skil 7510-01 Sandcat sander can be used on any wood surface and other materials. The micro-filter dust canister can help you keep your workstation clean because it will catch a majority of the dust and residue. Use the auto track belt to align the belt onto the center of your body and then adjust it. Included for your comfort is a soft grip, a flat edge sanding, and a lock on/off switch. When you purchase this kit, you will get sanding belt, vacuum adaptor, and a collection canister. The Skil Sandcat is designed to handle heavy duty projects such as stripping paint or finishing hardened materials. 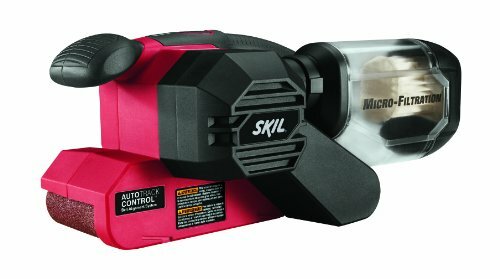 The Skil 7510-01 Sandcat sander is designed with a 6-amp motor, and its dimensions are 3 inches by 18 inches. The system comes with a pressure control option. The auto-track system can help keep the belt centered when you’re not working. The micro-filtration system can help capture any fine dust particles that fly your direction while you’re working, keeping your workstation clean. The clear dust canister can help you know when it’s time to empty out the dust bag; that way you never have to experience the bag giving out and the residue going all over your workstation. The Astro 3037 air belt sander is one of the industry’s newest and popular ways to remove spots welds from materials. It’s a quicker and more efficient method than other traditional methods. Other common tasks include metal prepping, cleaning up welds, buffering materials, and much more. 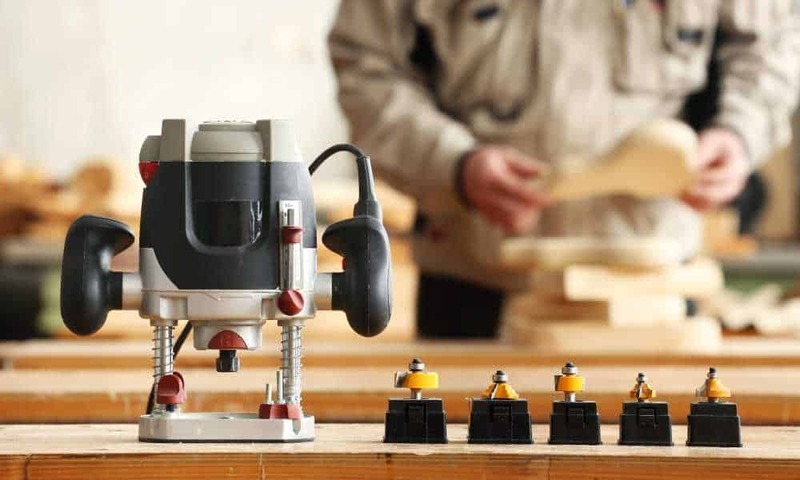 If you’re looking for a simple machine which can sand your projects with ease, then this is the one for you. The Astro 3037 Air Belt Sander is designed with an increased pulley space for more durable and thicker belts. This helps make the whole unit longer lasting and ensures that the belt won’t snap. This tool has a simple belt tension level which can help you adjust it and a protective guard to help protect the user as well as the tool. There is a nonslip handle grip so that the unit doesn’t accidentally slip out of your hands while in use. You can adjust the speed controls for different applications. The whole unit can go up to 16,000 RPM, allowing you to get your projects done in less time. Includes: 303740 -Sanding Belt 40 Grit - 1/2" x 18" 303760 - Sanding Belt 60 Grit - 1/2" x 18" 303780 - Sanding Belt 80 Grit - 1/2" x 18"
The Wen 6321 belt sander is a high-powered 7-amp sander with a heavy-duty belt which can help debur jagged splinters, finish edges, and strip paint from many surfaces. The high-power motor has a belt rate of 820 feet per minute, which allows for fast and easy material removal. The front roller can extend past the top edge of the housing, which makes it easier for the belt to sand even if there isn’t a lot of space. The sander weights 6 pounds, which can help limit how tired you get while it’s in use. Lastly, it has a lock-in safety feature which allows you to continuously sand without requiring constant pressure on the trigger switch. 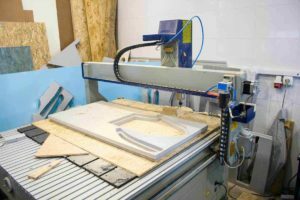 The machine has an easy-to-change sanding belt which allows you to quickly release and adjust the grits and makes changing the sandpaper easier. It has a spacious dust bag which catches any of the dust or residue that flies off your project. It has an extended front roller which hangs over the body of the sander and can help you reach into tight corners and narrow spaces. There is a lock on trigger switch, a 7-amp motor, a sanding belt, an ergonomic handle, and protruding front rollers. Lastly, it has a tracking adjustment that allows you to run straight by turning the tracking adjustment knob to your liking. The Hitachi SB8V2 belt sander is a powerful 9-amp motor with variable speeds. The motor is built to handle the toughest of materials, and allow removal of applications with a speed of up to 1,475 feet per minute. 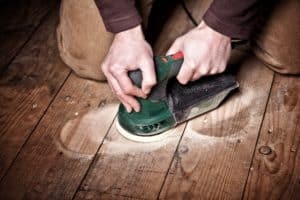 It’s ideal for wood, paint removal, steel, and other materials. The SB8V2 has a longer service life than other belt sanders thanks to the design of the resistant V belt, which allows the machine to stay in better shape for a longer period. Included is a five-year warranty if there are any defects in the product. 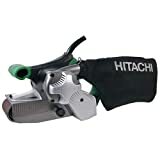 The Hitachi has a variable speed dial which can be changed from speeds of 820 feet to 1,475 feet per minute. A soft elastomer grip surface which is located on the main body and the auxiliary handles provide you with more comfort and a firmer grip. You can use the tracking window to increase your visibility of sanding, and use the sanding belt. The left side mounted dust collection bag can help improve your workstation and keep it clean. Lastly, the V belt is designed to be wear resistant and can even double the longevity of the entire unit. In conclusion, there are many different types of sanders on the market, but not all of them will fit your specific needs. 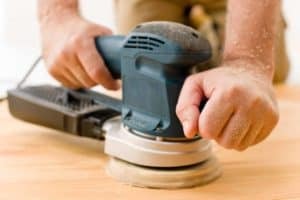 Make sure you choose a sander that can handle the amount of work you are doing, and make sure it can also sand the materials you are expecting it to. If we had to recommend one as being the best belt sander, we would choose the Tacklife Belt Sander. This is because it is designed to be effective, lightweight, and allow you to use it for multiple applications. It has a powerful motor and has been proven to be powerful enough to withstand many materials. The only downside is the weak belt, but you can buy replacements for it when needed and keep an extra on hand.